Local retailers and small business owners are busy busy people—and we understand, sometimes things fall through the cracks. To help alleviate a jam-packed schedule, there’s TaskRabbit. TaskRabbit is the task manager you’ve always wanted. All you do is submit a task, they then match you with a skilled “Tasker,” and the to-do is off your place. For example, if you can’t pick up your dry cleaning because you’re too busy with customers, put it in TaskRabbit and rejoice over having clean socks for the week. Looking for a way to encourage customer loyalty AND sales? Perka — a rewards/loyalty app —has you covered. All customers need to do is download the app and check-in whenever they come to shop. Every time they check in, they accrue points they can later redeem for furture purchases. That means customers get an extra incentive to come back to your store, plus everyone likes an extra perk with a purchase. Keeping up with expenses is enough work already. And if you have employees who consistently generate expenses or need to be reimbursed, a simple way of managing this would be a huge time and effort saver. Expensify gives you just such a tool. All employees do is snap a pictures of their receipt, select the expense it’s associated with, and submit it. Bonus: The app is free for individual users, so you may not need to accrue any extra expense to help with expenses. If you’re looking for simplicity when it comes to organizing your tasks, look no further than Todoist. With Todoist, you can access your daily and weekly to-dos from anywhere on your mobile—a big step up if you typically scribble them on a piece of paper and crumple them in your pocket. Now your employees won’t have to remind you of the many daily tasks you still have to accomplish alongside your daily business duties. Retail is often full of highs and lows, with very busy seasons throughout the year. So when it comes to apps for home furnishings, look no further than Asana. 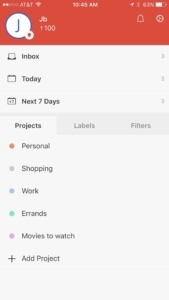 Asana is an amazing project management app that will help you organize your retail staff quickly and efficiently to ensure tasks get completed. Create a project and assign tasks to numerous individuals, then track progress from start to finish. Are you driving repeat sales with E-mail marketing? It’s a great idea to do so. And when it comes to simplicity and user-friendliness, look no further than Mailchimp. 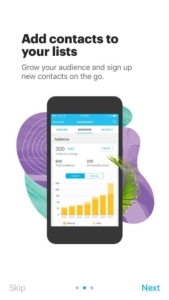 The Mailchimp app lets you collect email addresses on the go, manage your account, and keep tabs on your campaigns. It’s also a free service up to 2,000 email addresses. Many may see this as a surprising addition to this list of retailer apps, but your store’s ambiance is important. No one wants to shop while listening to radio commercials (or deafening complete silence). Spotify is a customizable music app that allows you play specific songs, full albums, or created playlists. Set-up your playlist and create the ideal shopping experience for your customers. Know of other apps that a retailer should really be taking advantage of? Let us know in the comments!